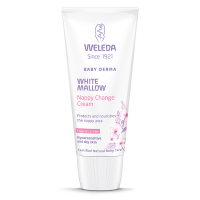 Weleda worked with midwives to create the Weleda Baby Derma White Mallow baby range, products of exceptional kindness to hypersensitive, dry and atopic baby skin. White Mallow Face Cream combines the tender touch of calming organic mallow and gentle pansy extracts with nourishing organic oils of coconut and sweet almond. Organic golden beeswax creates a mildly resistant layer helping to protect the skin, and gives the product it’s natural, gentle scent. Itchy and dry skin is soothed and protected, naturally. Also suitable for sensitive adult skin. Directions for use: Gently apply to the face daily. 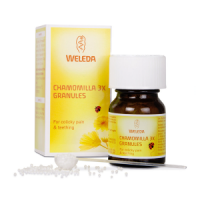 Also suitable for sensitive, dry and atopic adult skin. INCI: Water (Aqua), Cocos Nucifera (Coconut) Oil, Sesamum Indicum (Sesame) Seed Oil, Glycerin, Alcohol, Prunus Amygdalus Dulcis (Sweet Almond) Oil, Beeswax (Cera Alba), Cetearyl Glucoside, Glyceryl Stearate SE, Borago Officinalis Seed Oil, Carthamus Tinctorius (Safflower) Seed Oil, Helianthus Annuus (Sunflower) Seed Oil Unsaponifiables, Hydrogenated Coco- Glycerides, Althaea Officinalis (White Mallow) Root Extract, Viola Tricolor (Pansy) Extract, Xanthan Gum, Lactic Acid, Glyceryl Caprylate.